A photograph circulating the social media among ISIS loyalists on Wednesday shows what is claimed by the Islamic State to be the beheading of a Croatian citizen in Egypt. Posted on social media, the photograph, which Egyptian Streets has chosen not to publicize, was also shared along two screenshots from Egyptian media showing Croatian support for Egypt and the Kurds. On August 5, ISIS had released a video threatening to kill the Croatian citizen if its demands to the Egyptian government were not met within 48 hours. In the video titled “A Message to the Egyptian Government”, the Croatian hostage identified himself as 31-year-old Tomislav Salopek while a masked man in camouflage uniform stood behind him brandishing a knife. Tomislav, who is shown kneeling down on the sand with an ISIS flag at full mast behind him, revealed he is married and has two children. In the video, the hostage also confirmed earlier reports in Croatian media that he works for the French company CGG, a company that specializes in oil and gas geology. With the masked man standing firmly behind, Tomislav continued to reveal details of his kidnapping, which he read off a small white paper. “Soldiers of the Islamic State in the Caliphate of Wilayat Sinai caught me on Wednesday July 22nd,” said Tomislav as he read from the paper. “They want to swap me for Muslim women arrested in Egyptian prisons. This must be achieved before 48 hours from now. 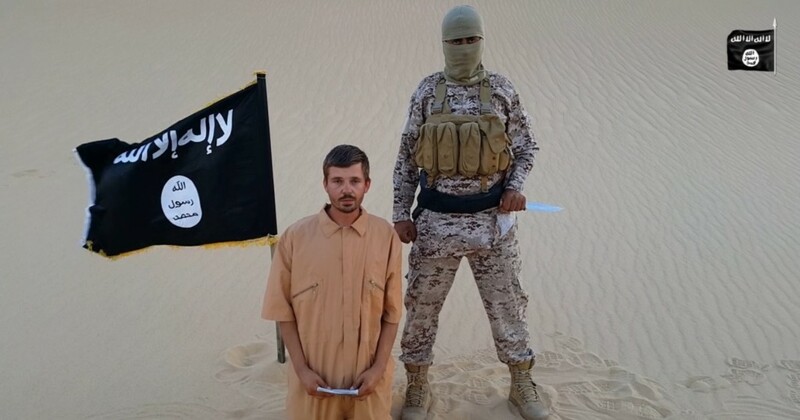 If not, the soldiers of the Wilayat Sinai will kill me,” continued Tomislav as the video came to an end. Wilayat Sinai is the name currently used by the IS-affiliated Ansar Bait Al-Maqdis, a Sinai-based terrorist organization that has been responsible for dozens of attacks in Egypt since the ouster of former President Mohammed Morsi in July 2013. The latest video comes two weeks after reports that a Croatian man had been kidnapped in Cairo by armed men. The warning from ISIS comes one day before Egypt is set to inaugurate its ‘New Suez Canal’ in an event that will see world dignitaries, including French President Francois Hollande, in attendance.